Hi, my name is Amelia McDonald. I’m almost thirteen and I live on Love Blossom Farm here in Lovett. Of course my mother treats me as if I’m still a baby—I’m not even allowed to date although most of my friends are. My mother has clearly forgotten what it’s like to be a teenager since she’s practically a dinosaur herself. Fortunately my grandparents gave me a phone for Christmas or I would be totally cut off from the rest of the world. Can you imagine talking to your friends on the kitchen phone? Pleeeease! Besides, no one calls anymore, they text. I like this boy Ned, and I think he kinda likes me. We’re both in choir at church and one day he held the door open for me. I guess he’s what my mother would call a gentleman. But anyway, I’m pretty sure that means he likes me. He gave me the cutest smile—he has a dimple in his right check that makes me go weak in the knees. I don’t know what I’ll do if he asks me out and my mother won’t let me go. He’ll think I’m some kind of major dork. I’ve seen Katelyn making eyes at him—I’m sure she’d laugh herself silly if I had to say no. I think I’m old enough to date—what do you think? Coming September 6! Pre-order your copy now! 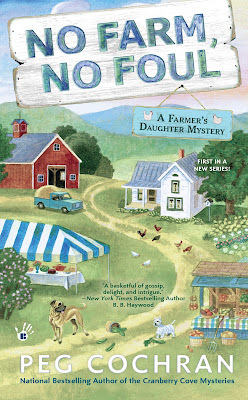 If you'd like to read the first chapter of No Farm, No Foul, visit my web site! Love the cover! Sounds like a great book! Sounds and looks like an interesting read. Love the cover. It would make a great jigsaw puzzle too. The book sounds great!! Yes, I can imagine talking to friends on the corded kitchen phone, the only phone in the house in fact. Thought I'd died and gone to heaven when my husband and I moved into a two story house and we had a corded phone on both floors. Only problem was that it was a party line. No answering machines either. Oh how far we've come or have we. Now we're tied to the world 24/7 and our children/grandchildren have forgotten how to really carry on a conversation. Love your books and looking forward to reading this one. Love your cover! As I mentioned before it makes me what to live on the farm. Oh this brings back memories! I do think 13 is too young to date though. I remember 16 was the magic age I could go on a date & I think it will be the same for my daughter. She turns 6 next week so thank goodness I have a while yet before I have to deal with all that! Thank you for the chance to win! I'm looking fowRd to reading this. Amelia sounds very true to life! Looking forward to the new book, thanks for the chance to win! My daughter went on her first "date" at 13. She enjoyed the movie, but the boy was a jerk and they "broke up" the next week, haha. Love that intro...can't wait to get my hands on this book! I would love to read this! Thanks so much for the chance! I would love to read this book it has been on my to read list for awhile now. I love your books! Thank you for letting me enter this giveaway. What a cute book cover. Thanks for the contest. I think at thirteen, a group date is a good idea. Movies or bowling with a group of friends. Thanks for the chance! Would love to read. Haven't read any of your recent books but I read two of your earlier ones (including a Meg London book). 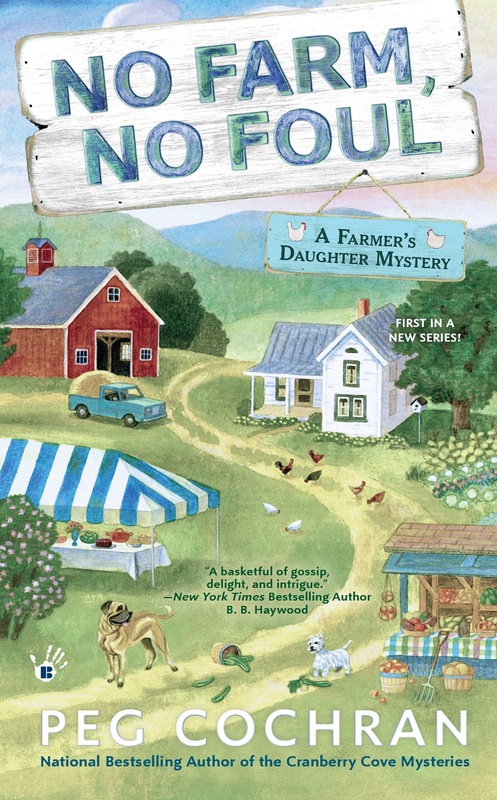 Can't wait to read "No Farm, No Fowl". This sounds like a great start to a new series. Really enjoy Peg Cochran's books. This is one book I know I'll enjoy just like I've enjoyed all of Peg's other books. Good luck with Ned & thanks for the giveaway. There are a lot of people looking forward to this new series! Thanks for the opportunity to win a copy. Fingers crossed! Very interesting. And I think she is too young to date. Yikes, almost 13 means still 12! I'm with mom...seems too young to me and no, I don't consider myself a dinosaur and I've got an almost 11 year old :) so I must be approximatley your mom's age. What an awesome series. Have added to my list!!!!! 13 is much to young to date, Amelia. I know you feel like your mom is just ruining your life, and that you'll never get to do what other girls do, and that the boys won't have anything to do with you if you can't date. But dating is special, and if you get started too young, then it loses that specialness, and boys just become old hat [yeah, my dinosaur is showing]. Perhaps you could go somewhere or do something with a whole group of friends, rather than pairing off. And Peg, I am looking forward to reading No Farm, No Foul. Sounds like a great read. 13 is way to young to date, Amelia. This sounds really fun. Thanks for a chance to win. Delightful...when I was 13 years old, I spent the summer with my aunt and uncle who had a small farm outside of Meridian, Idaho. I picked corn, gathered eggs, feed horses and cows, and had the time of my life...sans a phone of any kind! LOL, sounds like a good book! I met my husband in first grade! We would eat honeysuckle at the back fence of day care and get in trouble. Don't worry we didn't date until we were 16 because he had cooties until we were placed next to each other in a seating chart for European History class. The comment about the kitchen phone....I just had to post. I grew up on a farm. Phone was wall phone in kitchen by my Dad's chair. The cord was about 24 inches long, if that. Impossible to carry any sort of conversation with my friends, with my Dad sitting there. Dearest Amelia, Don't rush your sweet young years. There will be plenty of time for dating ahead. If you really must date, at the age of 13 it would be only with a chaperone. As far as talking on the kitchen phone, it's better than no phone at all. Luckily your grandparents blessed you with a phone but if you were my daughter I would be checking your calls to be sure there aren't any perverts calling you. A concerned individual. Thoroughly enjoyed the first chapter. Looks like a good series. I am totally enticed by the book after digging into that little teaser. My mother wouldn't let me be in a car with a boy alone even at age 15, so...when the boy of my dreams asked if I wanted a ride home, I ran back inside and grabbed my girlfriend to come with us. That was 51 years ago and we are still together and in love! (No Amelia... I don't think you are old enough to date. You mother is right.) I have never read any of you books but I am looking forward to it. Just looked you up on Amazon and am following you. Going to buy one of your previous stories. Would love to win this book. Looks really good and I also love the cover. Good luck and congratulations on the release. Thanks for the chance to win. Sorry Amelia, siding with your mom. At that age, only group outings with plenty of adult supervision. Not only did these wall phones have cords, we were on party lines. Several people shared the line, and any of the others could pick up and listen to you at any time. Dating at 13? That's too young, Amelia. Group dates are okay, though. As long as they are supervised by adults (and not somebody's older brother that isn't going to pay attention).